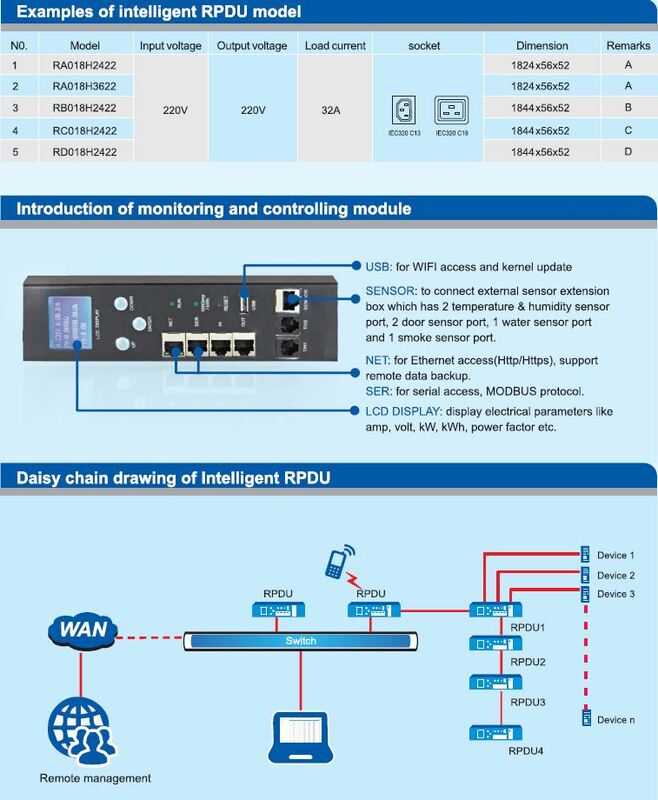 The R-PDUs are an evolution of the NPM PDUs, which retain the versatility characteristics by introducing numerous improvement factors. The metal frame adds robustness and mechanical strength to the device, protecting the electronics from the effects of accidental bumps. Can accommodate all types of sockets used in different countries. In Italy available Schuko, Schuko bipasso (Universal), C13, C19. Other requests on request. It is possible to have different color outlets depending on the intended use. The R-PDUs are equipped with dedicated software that allows access to the PDU remotely via the most common browsers (IE, FIREFOX, etc.). The most commonly used communication protocols are HTTP, HTTPS, SYSLOG, SERIAL PORT, RADIUS, NTP, FTP, SNMP, SMTP, IPV4. – vertical mounting, three-phase 32 A, with 30 C13 sockets + 6 C19 sockets, 3 X 32 A hydraulic circuit breakers, 3 meter cable. – vertical mounting, three phase 32 A, with 21 C13 sockets + 3 C19 sockets, LEDs coupled to each socket, 3 places of 32A hydraulic circuit breakers, 3 meter cable.